A brief description of the Family Tomb of Herod the Great follows. 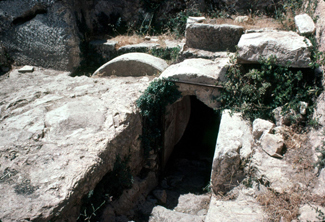 This monumental tomb is located west of the Old City of Jerusalem, and just east (below) the King David Hotel. It is one of the best preserved rolling stone tombs in the country (and there are very few of them). According to Josephus Herod himself was buried at the Herodium - located 7.5 miles south of Jerusalem. Bibliography: Josephus War 1:581, 228; 5:108.